Run back up the big hill and merge back with the 5k runners back to the finish line. I had a lot of fun and ended up being 2nd overall. I wish there would have been a few more obstacles, but I do think I will choose to do the adventure run again next year. The worst part of the whole race was running past the sewer smell on the way out and back! The hordes of gnats were pretty nasty in the first mile too. I think I may have eaten a few. I also committed a bit of a running sin.. I wore my race shirt for the race. So sue me. I did it last year too. and the year before. I bet I do it next year too. It is the only race I do this for so I don't feel bad about it. My sisters did it too. 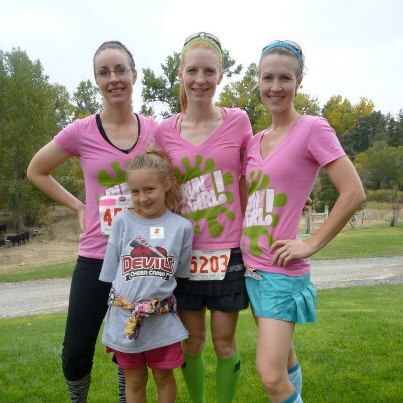 I forgot to bring my camera to the race, so here is a post race pic of my sisters and I and my niece Carter. I heard if you wear your race shirt to the actual race, a puppy angel loses his wings. I hope you're happy. Great job with the 2nd place OA finish! Great race. Sounds like so much fun. I wish my sister ran, it would be so much fun to run with my sister. I am doing the COlor RUn they coming weekend. I am loving doing some of the fun races, it beat hitting the same pavement very day. I really wish their we're more trails runs around here. That sounds like fun...not too crazy but still a challenge! I guess there can be an exemption for you just this once with the shirt!! That was the first thing I told my sister when she had her first race..."Don't wear the shirt tomorrow!!" Yeah I usually do super boring races, I did a Warrior Dash this past weekend and I will be sticking to regular road races I think! It was fun, but I just love a normal running race haha. Oh my goodness! You and your sisters sure do look alike! I love the shirt and I would have wanted to wear it for the race as well. So cute! sounds like fun! congrats on second place! Love the photo! Running with sisters is the best! Love the shirts and nice job on being second overall! I love that you and your sisters did this together! I'm laughing at Kara's comment. I'd wear my shirt in a race like too. Looks like you had FUN! how awesome that it was a sibling run!!!! that sounds like a blast! and congrats on placing! i would love to do a run like this sometime! yay for running with your sisters! my favorite race ever was the spartan race i did with my little brother. congrats on placing! Great racing- congrats! I love a good obstacle race :). I wish I had sisters nearby to do races with. Looks like so much fun! Congratulations on placing 2nd overall! This sounds like a fun race and the obstacles don't sound too tough. I could handle that!